Saturated fat has been blamed as the cause of heart disease and it should be avoided at all cost in diet. But the fact is NEITHER saturated fat NOR cholesterol cause the heart disease. NOT ALL people have heart disease has high blood cholesterol. MOST people who have heart disease DO NOT have high blood cholesterol. Other risk factors associated with heart disease include high blood pressure, age, gender (being male), tobacco use, diabetes, obesity, stress, lack of exercise, insulin levels and homocysteine level. There is the term ‘artery-clogging saturated fat’. The fat that collects in arterial plaque is primarily unsaturated fat (74%) and cholesterol. Saturated fat does not collect in the arteries like poly- and monounsaturated fats because it is not easily oxidized, and only oxidized fat ends up as arterial plaque. Vegetable oils are easily oxidized by over processing and heating. Saturated fat is not the only substance that the liver converts to cholesterol in our body. Other than fats, carbohydrate which is the main component in our diet also being converted into cholesterol. All the criticism that has been aimed at coconut oil is based primarily on the fact that it is saturated fat and saturated is known to increase blood cholesterol. No strong evidence that the coconut oil affect blood cholesterol level. In fact, numerous studies show that coconut oil has neutral effect on cholesterol level. The reason coconut oil has neutral effect is because it is composed of medium chain fatty acids. These fatty acids are burned almost immediately for energy production. So, they are not converted into any form in the body. Clotting happens when protein in your blood called platelets stick together. In healthy people, the blood become sticky when it become in contact with a wound or injury. But it’s dangerous when platelets stick to arterial walls because it can block the flow of blood and cause heart attack or stroke. Many people blamed saturated fat for increasing platelet adhesiveness (blood stickiness) thus promoting the development of blood clots. In fact, all dietary oil, both saturated and unsaturated, with the exception of Omega-3 fatty acids (flaxseed & fish oil) and medium chain fatty acids (tropical oil), increase blood stickiness. So, when you eat corn, sunflower, soybean, canola and peanut oil you are increasing your risk of suffering a heart attack or stroke. Heart disease is caused by atherosclerosis (hardening the arteries), which is manifested by formation of platelets in arteries. Contrary to popular belief, the principle component of arterial plaque is not cholesterol but protein. Atherosclerosis develops as a result of injury to the inner lining of arterial wall. The injury can be result of a number of factors such as toxin (alcohol and tobacco), free radical, viruses and bacteria. When blood-clotting proteins (platelets) encounter an injury, they become sticky and adhere to each other and to the damaged tissue, to facilitate healing. This is how blood clots are formed. Injuries from any source trigger platelets to clump together. When this process occurs in the coronary artery, which feeds the heart, it is referred to as a heart attack. If it happens in the carotid artery, which goes to the brain, the result is a stroke. Another major cause of arterial injury that can lead to atherosclerosis is free radical. These renegade molecules, found in tobacco smoke, polluted air, and many substances in our food and environment, can cause damage to cells and tissues. One common source of free radical is oxidized lipid (fats) found it rancid fats and refined oils that has been stripped of natural antioxidants. The only way to stop a free radical is with antioxidant. Antioxidants are molecules that neutralize free radicals, making them harmless. Coconut oil is a natural source of antioxidant and compared to other vegetable oils, coconut oil is chemically very stable and is not oxidized easily. Therefore, it can protect the heart and arteries from injury caused by bacteria, viruses, and free radicals. By removing the cause of arterial injury, coconut oil prevents further damage, allowing arterial walls to heal, thus not only reducing the risk of heart disease but actually promoting healing. Baba, N., Bracco, E.F., and Hashim, S.A. 1982. Enhanced thermogenesis and diminished deposition of fat in response to overfeeding with diet containing medium chain triglyceride. American Journal of Clinical Nutrition 35: 678-682. # I’m trying to find the original papers and books to link to references. Sejak tahun 1950-an, kajian menunjukkan minyak kelapa sangat berkhasiat dan digunakan secara meluas seluruh dunia. Namun, bermula pertengahan 1980-an minyak kelapa telah dilabel penyebab kepada penyakit arteri. Ini semua jasa Persatuan Kacang Soya Amerika Syarikat. Ini bukan sahaja terjadi kepada minyak kelapa tetapi minyak dari pokok palma lain terutamanya kelapa sawit. Mereka menekankan lemak tepu dari minyak kelapa dan kelapa sawit sebagai minyak yang tidak sihat. Sejak itu, industri makanan di Amerika Syarikat bertukar kepada minyak sayuran (kacang soya dan jagung). Kempen yang disokong oleh industri berbillion dolar ini memang bukan tandingan Malaysia dan pengeluar minyak kelapa lain pada masa itu. Walaupun tidak banyak bukti mengenai keburukan minyak kelapa tetapi tidak banyak kajian tentang kebaikan minyak kelapa dapat dipaparkan kerana sekatan yang dilakukan. Untuk memahami minyak, kita mesti memahami struktur kimia minyak itu. Disini, saya akan cuba meringkaskan penerangan agar senang difahami. Bila kita menyebut tentang minyak, akan ada kaitannya dengan lemak. Tetapi kita sebenarnya merujuk kepada triglycerides. Untuk membezakan lemak dan minyak, lemak adalah triglycerides dalam bentuk pepejal dan minyak adalah triglycerides dalam bentuk cecair pada suhu bilik. Triglycerides terdiri daripada beberapa asid lemak. Saintis telah mengkategorikan lemak ini kepada tiga i.e saturated, monounsaturated dan polyunsaturated. Banyak lagi kategori dibawah tiga kategori utama ini. Tetapi apa yang penting ialah setiap lemak berfungsi berlainan dari yang lain dan memberi kesan yang berbeza. Setiap minyak mempunyai tiga jenis lemak ini, Cuma ada satu yang lebih dominant menyebabkan ia dikategorikan dalam kumpulan tertentu. 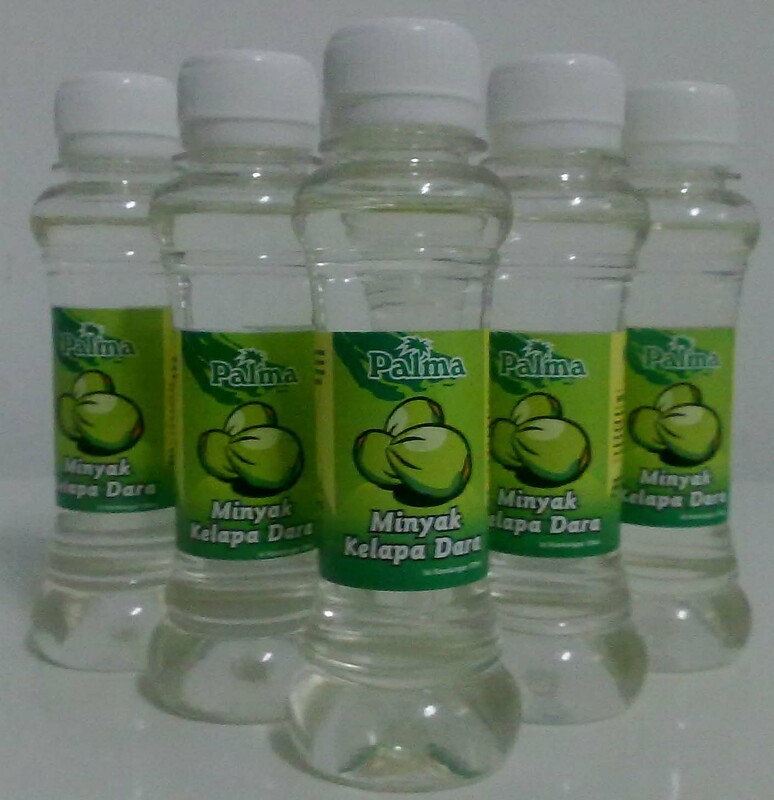 Minyak zaitun yang dikenali sebagai minyak yang sihat adalah lemak monounsaturated,mengandungi asid oleic. 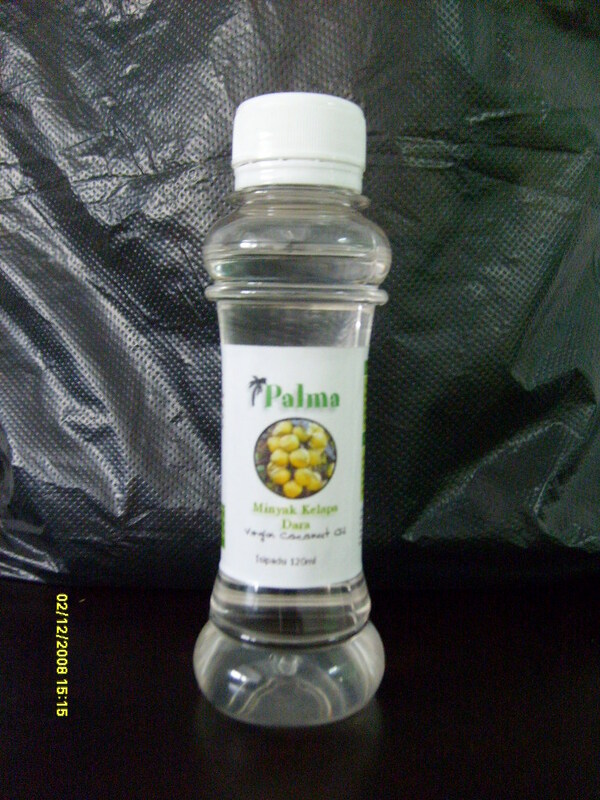 Minyak kacang soya adalah lemak polyunsaturated dan minyak kelapa adalah lemak saturated. Kita tidak boleh menyatakan sesuatu lemak (saturated, monounsaturated dan polyunsaturated) sebagai ‘sihat’ dan ‘tidak sihat’ dari tiga kategori utama kerana ia bergantung kepada komposisi asid lemak yang membentuknya. Lemak terdiri daripada karbon dan hydrogen yang membentuk satu rantaian. Asid lemak yang mempunyai 2 atom hydrogen bersambung di setiap karbon ialah lemak saturated. Ia saturated kerana karbon telah memegang semaksimum mungkin bilangan hydrogen. Asid lemak yang kehilangan sepasang atom hydrogen adalah lemak monounsaturated dan yang kehilangan lebih daripada dua atom hydrogen adalah lemak polyunsaturated. Bila sepasang hydrogen hilang, ini akan mewujudkan kelemahan pada gabungan karbon dan hydrogen asid lemak tersebut. Ini terdedah kepada serangan free radical yang oleh mengubah struktur kimia asid lemak tersebut. Oleh itu, asid lemak/lemak akan rosak dan bermutasi. Ini akan memberi kesan kepada kesihatan kita dalam jangka masa panjang. Tahap ketepuan lemak dan panjang rantaian karbon, menggambarkan sifat lemak itu dan kesannya keatas kesihatan badan kita. Semakin saturated lemak itu, semakin panjang rantaian karbon, semakin keras lemak itu dan semakin tinggi suhu leburnya. Semakin susah ia diproses oleh badan kita. We actually have been promoting VCO for massage since the first time we produce it. 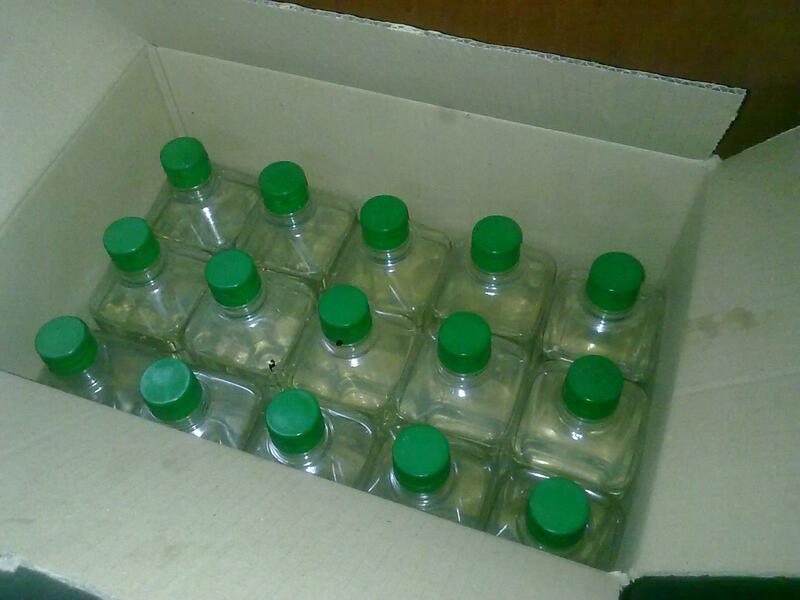 However, due to lack of exposure among local, we still promoting VCO 120ml. Lately, people start asking the bigger size. So, here we give everyone i.e Spa owner/ Traditional massage house to choose their own packaging. Options: Cap type, bottle type & bottle size. #Once you choose the packaging you want, give us some time to order the bottle and we only accept order minimum 10L for this package. 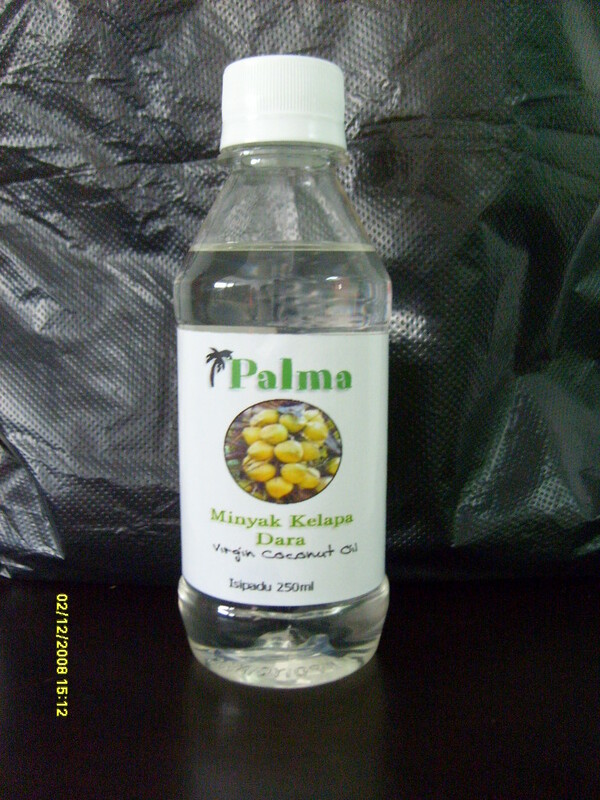 We produce our Virgin Coconut Oil from selected species of coconut. This species, contain higher oil than Malayan Tall tree. 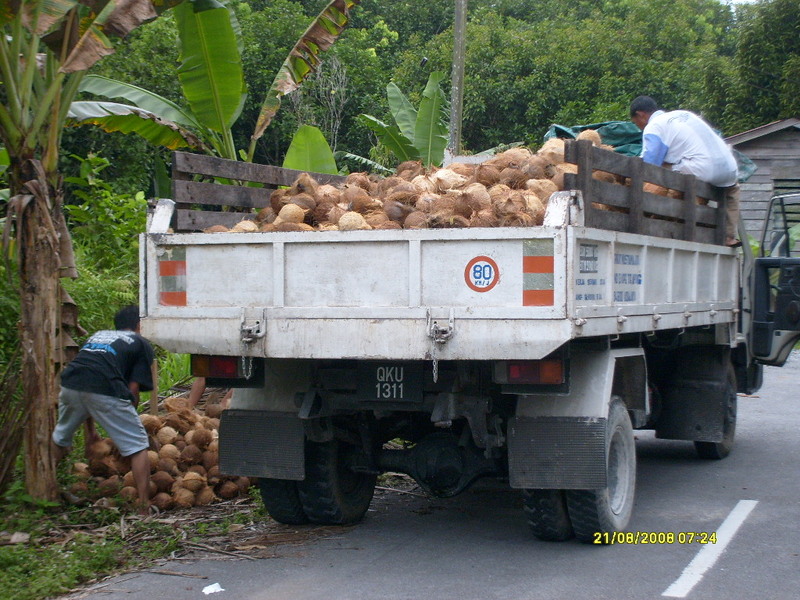 We pick our coconut on the same day we produce our oil. This is to ensure the freshness and quality. As soon as the coconut arrive at our shop, we start the production process by deshelling. With our machine capacity, we can de-shell the coconut at 360 pcs/hour. This is again, to mantain the freshness of our coconut. In coconut milk extraction process, we extract the milk using ‘food grade’ stainless steel machine. Our VCO process generally known as cold press method. As soon as the coconut milk is ready, it will go through pre-chilled process before through fermentation process for about 24 hour. The oil then will through filtering process until we get clear oil. # We realize that this method take a lot of time. We have studied few new methods and there are two new ways to produce VCO which is suit with our facilities and workflow. Later in this year, as soon as the machines arrive, we think we can produce more VCO daily. Sesiapa berminat untuk menjadi pengedar VCOPalma, kami memberi dengan harga yang berpatutan. It smells nice and it’s soothing for baby. But who would think such an old-time product, a nursery staple, could injure and kill? Toxicologist Dr Naren Gunja from NSW Poisons Information Centre at Westmead Hospital says most parents don’t realise the danger. “Once the child has ingested it depending on how much they ingest then it could be too late. Over a period of time, the child can die,” says Dr Gunja. Mums Gabby and Soraya say the drama started when their kids, Natalia, 4, and Gabriel, 3, were playing together. They discovered the two splashing baby oil over them and they’d drunk some. Soon, both kids were having difficulty breathing. Natalia was also vomiting, Daniel had a rash. An ambulance rushed them to hospital – the doctors’ warnings were grim. “He listened to his lungs for quite a while and he said ‘he looks ok’ and – this was just horrible – he said ‘look, there’s nothing we can do, this is something that if your child has done this, and it’s in his lungs there is nothing that we can do’,” says Soraya. When Gabby and Soraya checked the internet for accidents and side-effects they discovered the horrors – in the US, 20 kids a year die from breathing in household oils, 5 deaths are from baby oil. In total, around 80,000 household oil ingestion accidents are reported to the US Poisons Centre yearly. “The death the child goes through is absolutely horrific, the latest boy to die in America was Jayden Bryson, 18 months old, it took him 28 days to die, he suffocated to death,” explains Soraya. Why so toxic? Look at the ingredients and you see baby oil, sunscreen oil, bath, body and massage oils, make-up removers, nail enamel dryers, eucalyptus, camphor and clove oils – are all made from mineral oil, a petroleum ingredient from crude oil. Mineral oils contain hydrocarbons, a real danger to the stomach and especially the lungs – which can stop working. “A mouthful of baby oil ingested by a child is enough to cause it to vomit and if they breathe that into their lungs that is enough to cause lung inflammation … if enough of that happens it could lead to death,” says Dr Gunja. 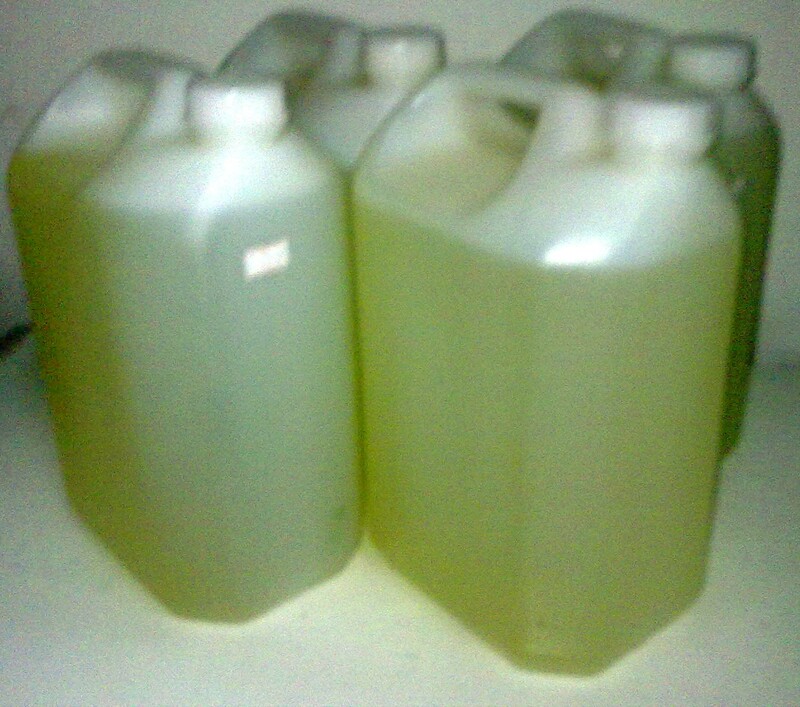 Mineral oils are also used for cleaning, as industrial and mechanical lubricants, in cosmetics and even pesticides. And, apart from they’ve been blamed for a range of health problems – allegedly acne, premature ageing of skin, and other skin disorders, impeding normal cell development and possibly causing vitamin deficiency. Luckily, Gabriel and Natalia survived their ordeal. Seven years ago the US Consumer Product Safety Commission made child-resistant packaging mandatory for oily liquids containing hydrocarbons – like baby oils, bath, body, hair and massage oils, and sunscreens. So, Johnson and Johnson Baby Oil sold in America has the compulsory child-proof lid. Why not in Australia? Johnson and Johnson wouldn’t appear on camera. The company’s email to Today Tonight says Johnson’s Baby Oil has been sold in Australia for 48 years and that our reports of accidents are the first they’ve received of a potentially serious health issue. Yet, they must be aware it was the accidents and deaths in America that forced them to put child-resistant caps on there. As a result of Today Tonight’s investigation Johnson & Johnson has informed us that they will after 48 years change to child resistant caps on all its baby oil products in Australia and worldwide.